May 7, 2011 January 20, 2018 P.O.P. If, like most Americans, you grew up in a Judeo-Christian environment, then you’ve surely had plenty of exposure to The Ten Commandments. Or at least you probably think you have. 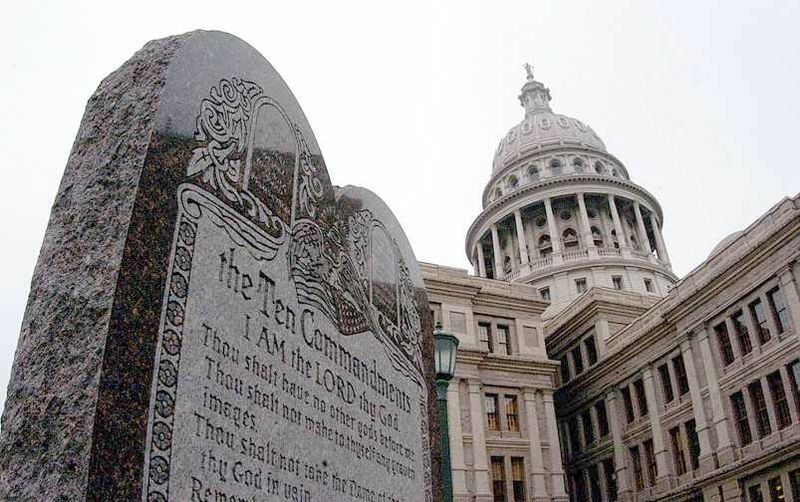 Lawsuits and fierce debates have been waged over the decalogue, and religious propagandists have argued that those two stone tablets are the very foundation of western civilization. But the decalogue is not set in stone. In fact, many things commonly believed about the Ten Commandments are demonstrably false. First of all, contrary to what you’ve been taught, this set of commands cannot be found anywhere in the Bible. Nowhere. At least not in that form. It’s actually a heavily edited version of two biblical passages (Exodus 20: 2-17 and Deuteronomy 5: 6-21) . This in itself is very illuminating, because the would-be theocrats who want to shove the Ten Commandments in your face are generally fundamentalists who claim to get their authority as self-appointed guardians of (other people’s) morality from a strict reading of “scripture”, with nothing added or taken away. But clearly they’re not practicing what they preach. Because there is another set of statements in the Bible that IS specifically referred to as The Ten Commandments. (Exodus 34: 11-26) though again the numbering is fuzzy. (What does God have against math, anyway?) Though there are some similarities to the other two sets, there are also some interesting gems like “Thou shalt observe the festival of weeks” and “Thou shalt not seethe a kid in its mother’s milk”. Not to mention some instructions for cutting down the altars and “sacred poles” of other nations, and taking their daughters for wives. Can you imagine some arrogant Alabama judge defying the law over divine instructions like these? And then there’s the first set of stone tablets that God dictated to Moses, who then smashed them in a hissy fit before anyone could read them. Supposedly the next set was a carbon copy; but it’s clear from these passages that Yahweh either had a poor memory or just changed his mind a lot. Someone once commented that fundamentalists might benefit if they stopped thumping their Bibles long enough to actually read them. There are few things that illustrate this truth better than the obsession over the so-called Ten Commandments. Praise God , Mary, that you see the need to think outside of the box, to be intioanvve in your approach to children’s ministry. It is easy to get caught up in doing things “the way we’ve always done it” or the way we experienced it as a child. Children live in a constantly changing world. They are used to variety, multimedia, and a fast-paced approach. On the one hand, we need to be careful not to get caught in a rut, not meeting children where they are. On the other hand, we need to be careful that in the process of trying to meet today’s children in ways they have come to expect in the world, that we keep our focus and motivation straight. I wrote a post for the MinTools.com blog about how we do not need to . The challenge for us is to keep children’s attention, make learning fun, and provide quality ministry but also maintain the focus on Jesus. At the end of the day, our methodology is not what will change their lives but rather, Jesus. In addition to the resources at TrainBibleTeachers.com, you might want to check out the page on our parent site. The Bible is such a mixed bag. On the one hand, it contains some vibrant folklore, magnificent poetry, and powerful wisdom. On the other hand, it contains some utter garbage. Unfortunately, many people don’t know the difference. I once suggested to a group of antitheists that the Ten Commandments, at their core, simply represent universal moral and philosophical truths, if one ignored the religious context. They absolutely refused to consider that as valid, even though that did not mean they could no longer criticize Fundamentalists for promoting their religious beliefs, because they could not distinguish between the actions of their opponents and the ideas they distorted. One even boasted that he tried everyday to break all 10 commandments. I asked him if he had murdered anyone, stolen anything, or lied about anything that day yet. Despite being criticized for attacking him, my point was of course to suggest that his claim was utterly ludicrous. You might have a valid point in general about the universality of the Ten Commandments, but if you strip away the religious context from something like “Thou shalt not seethe a kid in its mother’s milk”, I don’t see what you have left. I was referring to “The Ten Commandments” as modernly conceived. I agree with the overall point of your post regarding a literalist interpretation of Scripture, but the issue is more complex than you describe when viewed from a more moderate perspective. For example, there is the Documentary Hypothesis to consider regarding the three versions of the Ten Commandments. Though the distinction between the different versions is no longer believed to be as distinct as it once was, and allowing for the fact that translation into English eliminates many literary clues, the hypothesis tells us that the Old Testament as we now have it, at least through Second Kings, is a chimeric hodgepodge of perhaps a dozen different sources cobbled together into one narrative. Considering that, there are bound to be textual discrepancies and contradictions and duplications as each generation tries to make sense of the way the sources have been put together. I agree that the Ten commandments in its modern version is a valid list of basic spiritual guidelines that are of general relevance for everyone. And if one compares spiritual maxims from many different religions, they all share much in common. For instance the commandment, I am the lord thy god, thou shalt have no other Gods before me, can be generally considered as the same call to worship a higher power that is of the same in essence in all cultures and at all times. I say this because many of the most valued commandments and spiritual edicts observed by various faiths give the impression of being very similar. So if we believe in the spirit of love beauty and truth, we are free to given our higher power any name we chose, since all great iconic religious figures asked us to believe primarily in a divine power and to have love for our fellow men. I am aware that many of the first books in the old testament, contain a dizzying array of does and donts that direct nearly every facet of Hebrew culture, but what we commonly consider the modern version of teh Ten commandments can be considered to be a distillation of of the most important aspect of human spirituality. Too many does and don’ts can be oppressive, but simply obeying commandments that teach us not to Kill or steal etc. have a universal ethical appeal. As they should. The book contains Richard Alpert’s account of his own spiritual journey to enlightenment. He is also known as Ram Das.and, for what its worth, Alpert was a Psychologist who, along with Timothy Leary, pioneered research about the effects of LSD. But after examining the book I feel that it not frivolous or pretentious, but rather, a deeply reverent, loving, and wise work, that contains profound wisdom. The copy I consulted was published as a simple soft covered book which is a guide for enlightenment and which recognizes the spiritual principles of many different faiths and illustrates the underlying similarity common to them all. It was published by The Lama Foundation in 1971. After seeing this list, I have come to believe that all of the “who has the one true way, or who has the better religion” ways of thinking are completely human inventions that result in only polarization, division and ill will. But basically they all believe in love and that God and love are one. Even so, those who want to remain unique, will rationalize by saying all the others made lucky guesses? Jesus said, “I am the way the truth and the Light.” But can’t the same light simply be called by other names—despite what we fallible human beings may want to think? This passage is ambiguous enough that it can be interpreted in a number of different ways. A literalist interpretation would be that Man is saved only by belief in Christ as the Risen Lord. However, a more moderate interpretations would be that, since Christ’s sacrifice redeemed all of Mankind, past, present, and future, all people are saved regardless of their belief in the nature of Christ. Another interpretation, suggested by CS Lewis, is that through their love of justice and truth and their fellow man, and by their actions on behalf of other people, people make themselves righteous because they serve Christ even if they do not know it or don’t want to believe it.